I finally said it – the words I’d hoped never to hear coming out of my mouth. For a moment I felt as if I were having an out-of-body experience. Surely those words did not come out of me, I thought to myself. I’d recently come in from an evening bike ride where the heat index danced at the three-digit line. While the temperature was still warm and my body soaked in moisture, I found waves of chills running across my skin. Water, it seemed, was only making small dents in my recovery. For one of the first times found myself thinking it just might be time to be a little more careful about pushing my body around. Men, by nature, are not the brightest of creatures. In some ways it is amazing we’ve not killed of the entire human race by letting our testosterone-fueled egos lead us into making less than brilliant choices. As a matter of fact, I’m pretty sure no woman ever uttered the phrase “hey, hold my beer and watch this!” No, that phrase is pretty much restricted to the wasteland of competitive one-upmanship staked out by the male species. Which brings me back to my sitting on the porch; sweat trailing off my forearms in the heavy summer heat. Men don’t like to believe there is a chink in their virtual armor – the armor located in the grey, gooey real estate residing between their ears. Age, we like to convince ourselves, is just a number — that is until our body begins to point out the accumulating number is not just for show. Unfortunately for men, we are as hard of hearing when it comes to listening to our bodies as we are with everyone around us. In the spirit of full disclosure, I should let you know my wife is a saint. Over the years she grown to appreciate the fact that all the badgering in the world only makes overgrown boys more deeply dig their heels more into the ground. Whenever I seem to come up with a crazy idea (‘hey, I’d sure like to…) she is great at expressing her opinion or caution all the while knowing most men are just boys walking around in a larger body and there is only so much you can expect from them. So here I am, like many men my age, recognizing my body just might not be impenetrable to the effects of time after all. There just might be a bit of truth to appreciating that taking care of our bodies might require exercising the big muscle between our ears. And this, if you know men, is one of the least exercised muscles in they physical fitness regime. Today I hereby mark this week on the calendar of when I officially acknowledge time just might have an impact on my life going forward. Now does that mean I’m going to change what I do? Well, I certainly am not going that far. After all, I’m still a card-carrying member of male species. A woman is explaining to me about how she is no longer plugged into the world – and by her choice. Her salt and pepper hair is pulled tastefully – almost playfully – back around her head. Two-tone eyeglass frames, although contrasting colors, compliment her eclectic silver wingtip shoes. Her voice is friendly, strong, and articulate. Listening to her you can’t help but respect her choice. One day she made a conscious decision to take back control of her life – and did so by eliminating an element of her world that didn’t contribute to her happiness. Her smile is warm and engaging. She is not recommending others do what she did – just sharing something about her life with a stranger. The next day, while driving to the office, I felt a spot in my heart admiring her decision. As the sun began to change the color of the sky, a handful of little unsolicited thoughts began arriving in my head. Did I check my email? Was there anything on my calendar for first thing in morning? I wonder what is going on in the world of my Facebook friends? The world, if viewed through her eyes, is controlling me. Today our world is increasingly filled with fractured areas of activity constantly pulling at us for attention. And with each new avenue we allow into our lives, another piece of our mental real estate is occupied. I read book that recently the said one of the most difficult aspects of quitting anything is that we are erasing the investment of time we’ve already put into the commitment. Not to say the sum of our investment is valuable – it is just we feel as if our commitment of attention feels as if turning out backs to admit we were wrong. And for most of us, that is a very hard thing to do. Today, as more as more people become ‘invested’ in social media or other distractive outlets, the combined urge to know as well as continue to participate can be overwhelming. Even scientists point to the little droplets of endorphins released in our brains when communicating with all these ever-increasing leeches of time as an increasing problem. Our bodies, they conclude, become addicted much like an addict to a substance. Which brings me back to the very well adjusted woman with the sweptback ponytail. She, essentially, broke the chain of dependency – one feeding an outcome in her life she did not desire. Her investment, with her fresh eyes, was not valuable at all – but rather something getting in the way of her living a healthy and rewarding life. Her solution is not for everyone – but everyone can probably learn from her. She, when discovering the distractions in her life that were not contributing to her happiness, walked away. Our world today is filled with distractions – and only we give them value and power over our lives. At the end of the day, we are responsible for our own happiness. The programing of our minds – what we think, what we feel, what we believe – is ultimately up to us. Choose wisely. League City, Texas made The Wall Street Journal earlier this week — but not for what you might think. In a front-page article outlining the current influx of child migrants (“Flood of Child Migrants Spurs State Backlash, July 14), The Wall Street Journal piece discussed how the federal government is scrambling to find temporary housing for thousands of children who are streaming across the Mexican border. Some communities, however, already are saying no before being asked to help relieve the current crisis. While this may play well within the universe of political posturing, this is just the kind of thing that can come back to haunt a community. Closed-door policies, particularly when they carry the face of children, reek of obstructionism and insensitivity. The people we know in League City, those we meet at local churches and grocery stores, do not seem to fit this definition. Like it or not, the influx of children and young adults carries enough blame to go around to federal, state and local agencies. Immigration is one of the most appealing tenets of the United States — a place built as a beacon for those seeking a better life and future. Yes, we have rules — and yes, the rules are being broken or circumvented by desperate families who are sending their children on dangerous and risky journeys with hopes of reaching our borders. But, folks, this problem is now bigger than a simple immigration policy failure — this is now a full-blown humanitarian issue. These are, for God’s sake, children. Legally, these immigrants are not treated as those from our border nations. Those illegally crossing the borders from Mexico and Canada can be returned within days — sometimes hours with minimal process. There is no legally identified or approved political crisis from which they can seek safe harbor from within our borders. Today’s problem operates with an entirely different playbook — which we wrote, by the way. These children, rightly or wrongly, are defined differently under the laws that we created. Seeking protection from difficult political circumstances requires a complicated and time-consuming process involving courts, temporary housing and judges. And with the volume of the current crisis, the system is going to be temporarily outstripped. The system will face huge delays in providing reasonable due process. Folks, this is approaching a crisis — one identified by the faces of desperate children. We, as a nation, do not want to be on the wrong end of this equation. While we can rightly blame the federal government for failing to lead — or make any tangible reform — in the area of immigration, we cannot ignore that there are children on our doorstep. Let’s put politics aside and find a way to take care of these children. The world and our maker are watching. Recently I learned one of life’s most valuable lessons from a man with over a billion reasons to ask me to leave him alone. Dressed in black and green striped surf shorts, a crumbled yellow t-shirt, and flip-flops, he is extending his hand to introduce himself to my wife who is waiting a few feet behind me. Standing on a small wooden boat dock located on a remote island two thousand miles from home, my path in life somehow crossing with billionaire and business entrepreneur, Richard Branson. Yes, Virgin Airlines, Virgin Records, Virgin…well, about all things Virgin. I’ve stepped off of a small boat for provisions when he, too, is there to gather a few items. Alone and accompanied by only his trademark sunglasses and long flowing blonde hair, Branson pauses to share a few moments with me. There are, from what I’m told, less than one hundred people living on this patch of sand and rock where we are visiting. He is polite as we share a few moments – me mentioning to him how he was a positive influence in our son’s interest in media and business throughout college. It is then he does the remarkable. Pausing, he looks over my left shoulder and sees my wife hanging back as he and I visit. Stepping forward, he reaches out to her, extending his hand, and bowing ever so slightly to introduce himself to her. Smiling warmly, he then invites her into our conversation – making my wife feel welcome into a small moment on an even smaller patch of real estate. I’ll be honest; I will never forget the lesson I learned at that very moment. From a young age we are all taught to respect others, to make everyone feel welcome and comfortable. To do otherwise is to project a self-image of superiority, making others feeling less worthy of your time and attention. But, as many of us know, sometimes those rules tend to be forgotten when fame and fortune come some people’s way in life. 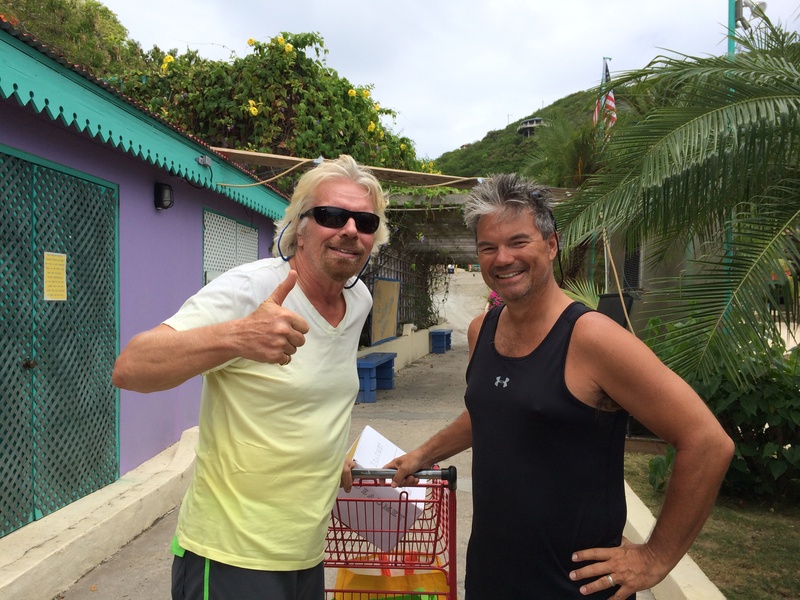 Richard Branson, by extending his hand to my wife and inviting her into our brief conversation, was showing to me that he, one of the world’s most wealthiest and powerful men in media, was a gentleman first. To him, the fact the three of us were standing alone on a tiny boat dock did not change the universal rules of respect. I wanted nothing from him and he surely did not need anything from me. There were no witnesses, no expectation for him to be on his best behavior. But there, with no reason to put on false airs, he made sure to make a perfect stranger – and one he would most likely never see again – feel welcome. Since this odd crossing of our pathways, people have asked me what it was like to meet such an icon of modern history — a man so highly regarded, the Queen of England knighted him. In my mind I think of his ventures to space, balloon races around the world. I think of his model-breaking business, his commitment to leave the world a better place than he found it. And then I think of the handshake he didn’t have to make. That is the story I will tell – and forever carry in my heart as a lesson to never forget. The Fourth of July is more than hot dogs, colorful banners and fireworks. As a matter of fact, many historians point to this date as the event that changed the course of mankind — the moment when the “Free World” began. We all know the romantic story of how a group of ragtag colonials rose up against the powerful king and his large army to create an independent nation. But the truth is, there is much more. So much more. Take a moment to reread those words before moving on. We need to remember that until this moment, rights and privileges were reserved for the rich, powerful and few. The concept of an individual’s rights being equal and superior to those governing was a radical — it was an earth-shattering challenge to those in power around the globe. And the idea that these rights are extended to us by our Creator — not the person who happens to be wearing a crown or holding a gun. This concept was as revolutionary intellectually as it was on the battlefield. Frankly, it still scares the daylights out of those in power around the world. And it was just this empowering concept that changed the course of human events forever. Furthermore, Jefferson and the Founding Fathers believed the power of government lay with the people — that the government served at the will of the farmer, the doctor, the shopkeeper. The government was simply to serve the needs of the people, not to dictate what the individual could do. Fast-forward 238 years, and we can see the world continues to rock from this radical concept. While citizens of the United States of America continue to enjoy the greatest range of freedoms on the planet, a vast majority of the human population still lives in a world diametrically opposed to ours — where the individual serves at the will of the government or powerful. Rights and freedoms are replaced by the daily need for finding food, water, and shelter — all under a heavy air of intimidation. So this Fourth of July we encourage you to reflect on what this date really means in the context of mankind. Because on this date, in 1776, the world changed forever.